Welcome to the 2010-2011 academic year! Barbara and Robin will be available for consultation in Driscoll 313 (x96231) on Tuesdays and Thursdays from 10:00am until 4:00pm. Stop by and say hi! 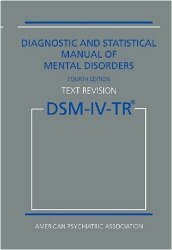 Falvey is currently running a trial of the online version of the Diagnostic and Statistical Manual of Mental Disorders, 4th ed. (affectionately known as the DSM-IV), published by the American Psychiatric Association. The manual provides clear descriptions of more than 300 mental health disorders for both children and adults, as well as known causes, statistics regarding gender, age at onset, and prognosis, and recommended approaches to treatment. Trial ends Sept. 30. Let Barbara know what you think. 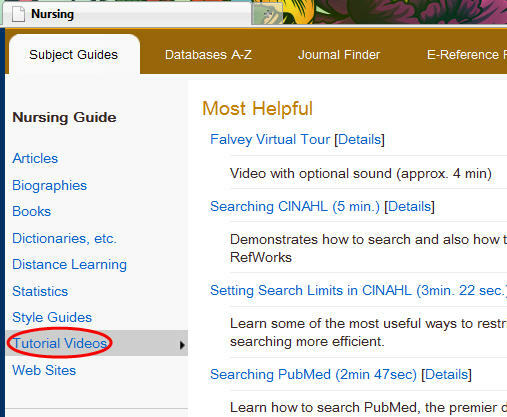 Videos can be easily accessed by clicking “Subject Guides” at the library homepage and then choosing “Nursing,” and then “Tutorial Videos,” or just by typing tutorial videos into the search box at the top of the library homepage and then choosing Nursing.